Enjoy this 10-hour private tour to experience the best of Ubud village with lunch. Visit the most sacred monkey forest in the heart of Ubud. Have a jungle swing inside the coffee plantation. Stop at Tegalalang rice terraces and have a spiritual feeling inside the holy spring temple. Pamper your eyes to see Tegenungan waterfall where you can relax and swim. There is a maximum group size of 15. Begin the tour by meeting your driver at your hotel lobby with a warm smile before being driven to the middle of Bali in Ubud village. There you can stop at the popular sacred monkey forest, where you will find around 700 Balinese long tailed macaques in wild. Walk along the 12.5 hectares forest as the perfect place for the healthy monkeys. Find three temples inside guarded by the monkeys live in harmony. Next, drive to the north of Ubud to stop at a coffee plantation where you can taste various kinds of coffee and teas. There you can see also the most popular coffee from an animal poo. In the plantation, you can also try a jungle swing. 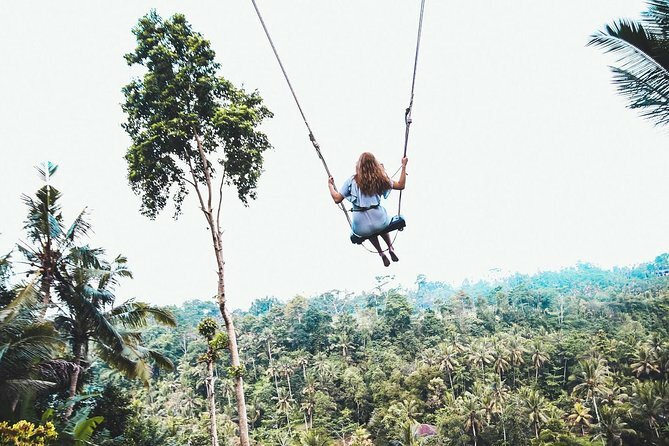 Challenge yourself to have a swing with around 30 meters string swing to the valley or jungle. You will get a different experience and lots of pictures. Before you have your lunch, have a short trek to the magical rice terraces in Tegalalang village. There, you can see the local farmers in their daily activities.Enjoy your lunch at a small place inside the jungle with a valley view and rice field view. After that, you will visit Tirta Empul a holy spring temple. You can see how Balinese people doing a holy blessing before they pray at the main temple. Finally, your last stop is Tegenungan waterfall with a beautiful green surrounding make the area very fresh. Take a short walk to get closer to the waterfall or just see the view from the top hill. Your Bali Hotel in the area of Ubud, Sanur, Kuta, Seminyak, Canggu, Denpasar, Jimbaran, Nusadua and Uluwatu. Had an absolutely amazing day! Our driver and tour guide Gede was brilliant - he was very informative, funny and a good laugh! Would definitely do this tour again! The jungle swing was Amazing, the rice terraces were beautiful and the monkey forest was so much fun. Didnt have to ask Gede to take photos for us as he was so helpful and always asked when we got to the best spots for photos. Definitely recommend!! Our driver (I forgot his name, i'm sorry!) was the best. This tour included everything (tickets, parking, gas, lunch, etc) We were not interested in the monkey sanctuary, so we asked our driver if we could go to the Ubud art market instead and he was very accommodating. He let us go on our own pace and we actually went over the time we were supposed to leave, but our driver did not rush us.